The Icelandic Energy Portal is cooperating with Reykjavik University and the University of Iceland, as scientific and educational partners. Thus, we sometimes introduce research by university scholars and students. Today, we will focus on the findings in a recent thesis towards MSc in Industrial Engineering at the University of Iceland, by Ms. Svandís Hlín Karlsdóttir. The title of the thesis is “Experience in transporting energy through subsea power cables: The case of Iceland”. It analyses the experience from subsea power cable projects in Europe to bring new aspects and gain more information and insights to this project. The main focus is on technology, reliability and environmental impact. In the thesis, this study of the European experience is transferred to Iceland and is evaluated as to which technology is suitable for Icelandic conditions, what to avoid and what to keep in mind, and also to evaluate the reliability of possible subsea power cables from Iceland to mainland Europe, or to Great Britain. The need for increased renewable energy source utilization has forced the technology forward. Challenges are constantly confronted with new developments in technology. The development in material and manufacturing processes has increased power capacity and voltage rating and made the cables more robust. The cable systems are frequently being laid at greater depth and over longer distances. The maximum power capacity is 800 MW (single cable) at 500 kV or 1,000 MW (two cables) at 320 kV, for mass-impregnated cables and extruded XLPE cables, respectively. The key factors to a successful HVDC subsea power cable project is a thorough marine survey to find the most suitable route and for design of the cable. Great expertise in installation method is also crucial, concerning choice of vessel, equipment and crew. Savings in investment cost, which could lower the reliability of the cable system, could result in higher operation and repair cost in the future. When a cable is damaged and is in need of repair, there is always need for a specialized vessel, equipment and crew. That is independent on the size of the damage and could therefore be a big part of the repair. The time waiting for weather can also be very expensive. Additionally there is loss in revenues when no power is transmitted. Those considerations must be optimized during planning and designing of a cable project. With prior experience and development of subsea cable systems the reliability has improved. From 1986 to 2009 the reliability has improved from 0.264 failures/year/100km to 0.100 failures/year/100km. Operation procedures with real-time monitoring improve maintenance of the system which can prevent major damage to occurring, resulting in better reliability and longer life time of the system. When implementing such a large complex electrical system there are always concerns about the environmental impact. According to the latest researcher and environmental impact assessments in Sweden there are no threats to the surrounding area and it will not suffer permanent damage, from installation and operation of the cable. Latest technological developments have decreased the electrical magnetic field and improved installation methods. The magnetic field is so low that sensitive marine life and ship compasses have not been influenced in a bad way, according to the latest research. The cable route from Iceland to mainland Europe will lay under the North Atlantic Ocean passing the Faroe Islands and will be approximately 1,170 km long and reach a depth of 1,200 m. The suitable technology for Icelandic conditions is two mass-impregnated single- core cables, each transmitting 500 MW at 400-450 kV in a bi-polar configuration. That solution improves reliability and eliminates magnetic fields. It is recommended to have copper conductor at the shallower parts and aluminum for the deeper colder part because of the increased laying tensions. Cable burial of at least 2 m is recommended for the whole route to protect against external violence where possible. 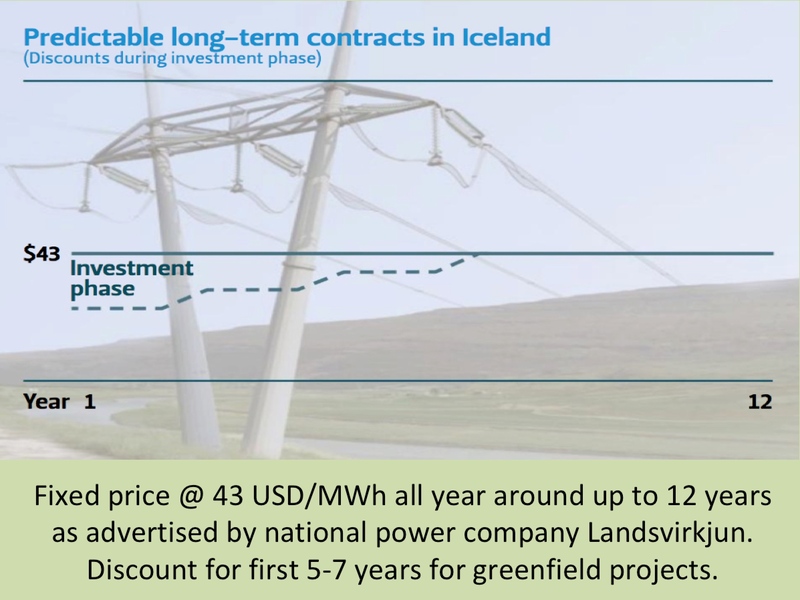 The failure rate for the subsea cable between Iceland and mainland Europe is estimated at 0.1 failure/year/100 km which results in 1 failure a year. The outage duration for each repair is dependent on fault location and weather conditions. For a fault location near shore there is more accessibility of weather window which reduces outage duration. The outage duration is higher far offshore but there is also less probability of damage, as the cable will be laid at great depth. The availability on the subsea cable is variable between seasons and locations. During winter the access to repair is less than during other seasons. The average unavailability of the system due to damage is estimated at 12% but with less probability of damage at great depth the unavailability is less, or near 10%. If sensitive marine species can be avoided along the cable route, the environmental impact is estimated to be low. There is no relation between magnetic fields of HVDC subsea cables and threat to marine life and with the cable type recommended there is no danger of chemical impact, or oil leakage. By laying the cables close together the magnetic fields can be eliminated. Landmarks on the sea bottom formed during cable burial is said to recover in approximately one year. Developments in technology are of special interest. Future technology like superconductors and advanced maintenance tools being developed will increase power capacity and minimize duration of outages, resulting in more asset feasibility. Also, the expected future development of extruded XLPE cables will be of importance. Possible future projects could consist of more specific analysis of the sea state to evaluate suitable routes based on reliability of different locations and to collect real operation data from the owners and operators of the HVDC subsea cable systems.